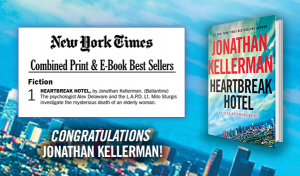 “Heartbreak Hotel” is a #1 New York Times Bestseller! Congrats to the team at Ballantine and Jonathan Kellerman on another #1 bestseller. “Echoes in Death” is a #1 New York Times Bestseller! 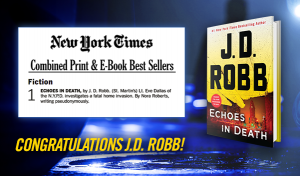 Congratulations to the team at St. Martin’s Press and JD Robb for Echoes in Death hitting the New York Times Combined Print & E-Book Best Sellers list at #1!